Lately, Fluffy and I have been reclaiming the office I abandoned when I got fungal pneumonia and got carted away in an ambulance on December 5th of 2012. That was a fateful little adventure. Little did I know when I left the house that day that life as I knew it was going to change forever, thanks to a microbial fungus. You never know from one day to the next what’s going to happen to you. Now more than 18 months later, with the help of physical therapy, miracle drugs and some additional stair rails, I am able to visit the second floor of our home again. Anyway, going back to my office has been like going to an archaeological dig, and uncovering the treasures layer by layer. Well, “treasures” may be a bit of an exaggeration. You have never lived until you’ve opened a refrigerator that has been sitting idle for eighteen months. 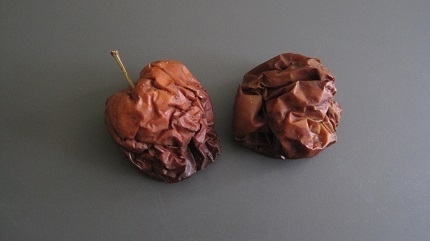 Let’s just say that apples can lose their personality just a smidge if left to fend for themselves for a year and a half. The first thing I uncovered outside the refrigerator was a plastic bag of 25 lithium batteries. They were still in their blister packs, securely packaged and ready to use by December of 2013. I have no earthly idea why I purchased these batteries, mind you. I do not use hearing aids, and they would have had to be big hearing aids, because these particular batteries are about three-quarters inch in diameter. What possessed me to buy 25 of them? I guess I will never know, but I suspect my Mormon food storage mentality could have played a role in the — oh, wait! Now I know. Back two Kindles ago, I used to have an external light source that ate batteries like crazy. It was the clip-on light that used those lithium batteries. Mystery solved. As much as I hate my newest Kindle Paperwhite, maybe I should go back to that ancient Kindle that ate batteries like people eat popcorn. I wonder if those expired lithium batteries still work. People, do not buy the Paperwhite. Piece of junk. But I digress. Getting back to the desk, I see that no matter which drawer I open, I find fossils. This does not surprise me. I am a fossil junkie. I have a whole shelf of fossils on my bookshelf wall, the prize fossil of which is the blooper fish that died in the act of pooping. (Never let it be said that I ever grew up.) But this doesn’t stop me from collecting little fossils and storing them wherever I can find an empty spot. 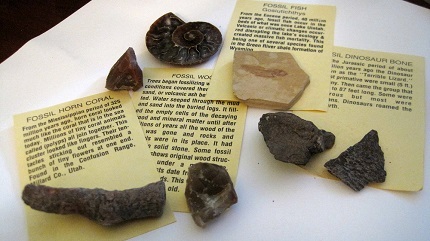 I loved fossils even before I became one. My next find was an important one. I found three unused, unworn pair of contact lenses. I knew these puppies were in my possession. When I purchased them, years ago, I hid them away in a safe place so I would have them when I needed them. Unfortunately, I hid them in too safe a place. When the time came that I needed them, they were nowhere to be found. All the prayers in the world did not result in their being uncovered. So I went back to the ophthalmologist and had my eyes rechecked for a new prescription, even though I did not need one. What an unnecessary waste of time and money! Then, post-coma, I broke a contact lens. Once again, Fluffy went into my office. Once again, all the prayers in the world did not result in those contact lenses being found. So I went back to the ophthalmologist and had my eyes rechecked for yet a new prescription. This time, to my surprise, I learned that my eyes had improved dramatically since my coma and I needed a new prescription. Nevertheless, these three unworn pairs of contact lenses will make perfect backup pairs for traveling or other emergencies, and I am tickled pink that we found them. And this time, I have put Fluffy in charge of them so that if we need them, we are more than likely going to be able to find them again. 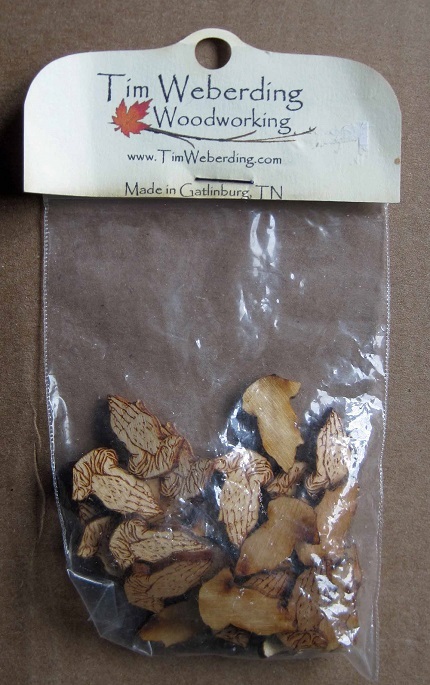 In one drawer I found a carved bag of wooden praying hands. Did I purchase them? What in the world possessed me to do so? I can only assume I bought them to use for a Young Women object lesson of some sort. I never taught the lesson, and now I can’t remember why I ever purchased them. If anyone ever wants me to lend them a hand, I can surely do so. I can lend them two — or even a bunch, if they need it. One thing that delighted me to no end was a certificate from Fluffy from one Dungeness crab from Costco. He gave it to me when I got home from the hospital, or more likely when I was still in the hospital because I found it in a big bag of cards and letters I received when I was still hospitalized and too weak to read or understand or remember what I was reading. The certificate was one of many treasures I uncovered when I was going through that bag. There were hand lotions, candy bars, and many letters I will keep forever — letters that I only discovered last week because I was too fragile to remember them the first time around. What wonderful, inspiring letters they were! Fluffy had forgotten all about the gift certificate and was just a little bit sad I found it, but I will think of him fondly as I eat every glorious mouthful of that crab in all its crabby glory. 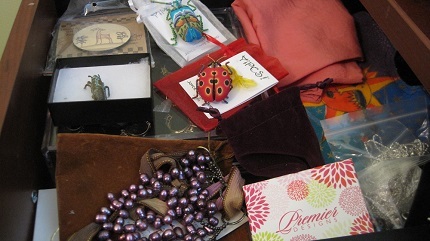 I found lots of jewelry — so much that I finally put it in its own drawer. Yes, I have a jewelry box in the bedroom. But my favorite stuff is what I kept in my office. If you look carefully, you can see a real, live (okay, real, dead) cicada that has been dipped in copper and turned into a broach. I do like cicadas! Only my favorite jewelry was in my office. The other stuff is probably in the bedroom, where real jewelry lives. Then there was a string of purple carabiners. I remember buying them on eBay, but I have no memory why. I have no need of carabiners. Furthermore, these are too flimsy to be of any real use. Did I buy them because I like the word “carabiners” (and yes, I prefer that spelling to “carabineers”), or because they were purple? With me, one never knows for sure. 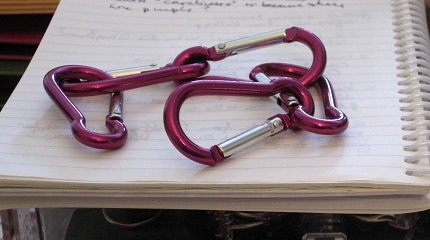 Did I buy them because I like the word “carabiners,” or because they were purple? With me, one never knows for sure. I found more sewing kits than I could count. Some of them were ingenious, such as the ones whose needles threaded themselves. Others were compact. Others were complete. All I know is that there were a lot of sewing kits, and whenever we need a needle in our house, we are never able to find one. 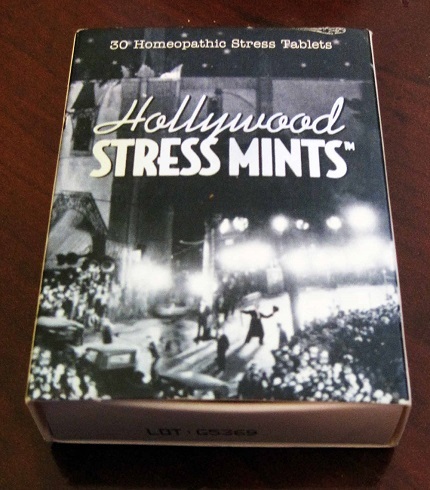 I found a box of Hollywood Stress Mints. I am sure they work. After all, when I think of a place that is stress-free and full of love and joy, Hollywood is the first place that comes to mind. When you’re contemplating peace and serenity, isn’t Hollywood the place you think of first? 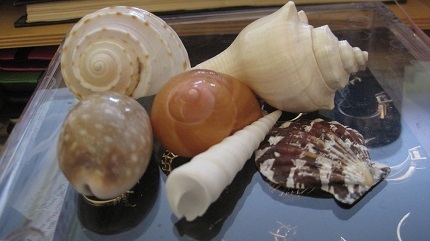 Although I did not find as many seashells as I found fossils, I found a whole lot of seashells. They were in drawers throughout my desk. There were pretty ones, and ones that I was not sure why I had purchased. Maybe I found them on beaches somewhere. No. I doubt it. Looking for seashells on beaches would be work. It’s easier to pick them up in seashell stores or buy them on eBay. Maybe these seashells will be fossils in a billion years or so, and I will love them even more. The next item is something that is a piece of horror. In fact, I have wondered on numerous occasions whether I should keep the thing, or whether I should take it out in the yard and give it a decent burial. I once wrote a column about white elephants, and the fun that Fluffy and I have with white elephant exchanges. 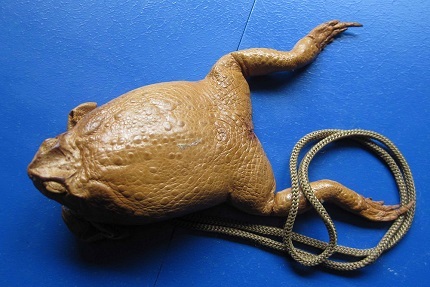 Our friend Marsha Zimsky responded by sending the white elephant of the century to us — a frog purse that consisted of a whole dead frog, eviscerated and tanned by the miracle of taxidermy, with a zipper in its underside so people can put coins inside. If you go to eBay and search on “real frog purse” you can find some. When I looked on Saturday night, the prices ranged from $3.99 all the way up to $164.50 for the same sort of purses as ours (although I must admit that ours looks somewhat better). Should we bury it, keep it, or give it away as the ultimate white elephant? Marsha sent the frog purse to us intending that we use it in our white elephant exchanges, but we couldn’t bear to part with it. It stays in my office, as a fond reminder of Marsha. That’s a pity. It would be the white elephant to end all white elephants — better, dare I say, than the Smoking Baby. 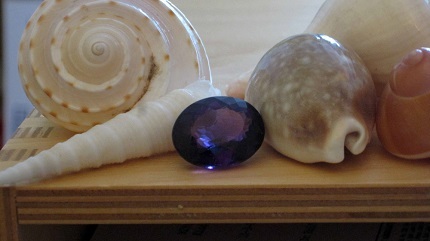 I also found a giant purple amethyst. It’s a big honker of a stone — almost the size of the pad of my thumb. I’m not sure what I’m going to do with it. In any case, these days I’m more excited about Kelly green amethysts, just because nobody knows what they are. But it’s still a beautiful stone, and it deserves a place — well, somewhere. It isn’t green, but this amethyst is nonetheless beautiful. 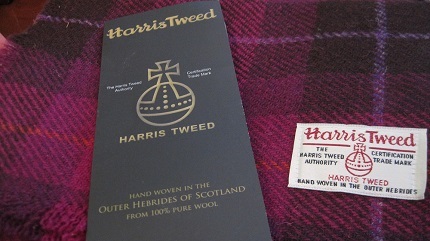 In one drawer I found a lovely Harris Tweed scarf. I remember buying the scarf, after seeing a wonderful video presentation in a church meeting that was ever-so-inspirational, and that featured a sweet little old lady or man making the Harris Tweed wool. I was so inspired by the film that I went home from the meeting and purchased the scarf, even though I never, ever wear scarves on my coat, and I would never, ever wear a wool scarf in any case. The thing was pretty expensive, but it was a lovely scarf. Now I have a wonderful souvenir of a video I cannot find on the internet and cannot see again. I know this inspired me somehow, but I cannot remember how or why. 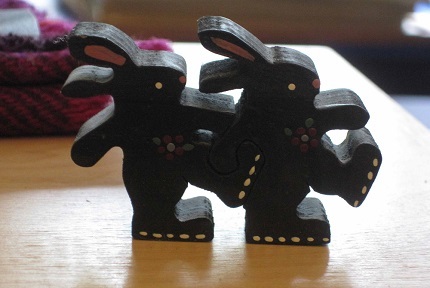 I also found a pair of bunnies, which will go atop my computer monitor when I’m in my office again. I have a pair of bunnies atop my monitor already, but we have a saying in our house, which is that you can never have too many bunnies. Anyway, once those bunnies are atop my monitor, all will be right with my office. In my office, you can never have too many bunnies. No, do not send me any bunnies! They have to be the right bunnies. I think the thing I’ve reclaimed from my office that I treasure the most is not a thing but a quotation. Of all the quotations I have ever read, this is the one I treasure most that is not scripture. It was written by C.S. Lewis in “The Weight of Glory,” and it meant so much to me that I had many copies of it laminated. After I gave them away to the Young Women, I brought the rest home and scattered them around the house. There are no ordinary people. You have never met a mere mortal. It is a serious thing to live in a society of possible gods and goddesses, to remember that the dullest and most uninteresting person you talk to may one day be a creature which, if you saw it now, you would be strongly tempted to worship, or else a horror and a corruption such as you now meet, if at all, only in a nightmare. All day long we are, in some degree, helping each other to one or other of these destinations. I don’t know if that quote does anything for you, but I think about it all the time. People may drive me crazy, and I may think obnoxious thoughts about some of them. But you had better believe I am kind to every last one of them, because I think of that quote constantly. I do not want to be the cause of anyone going astray and blaming me on the last day. The very thought haunts me. And the thing is, I know I offend people without even knowing I do it. It eats me alive. 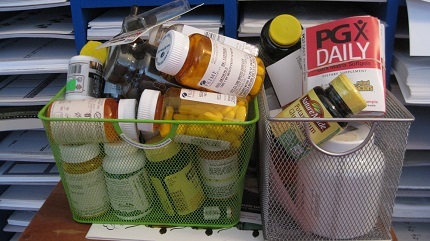 If there’s one thing I found a whole lot of in my office, it had to be medicine. This only makes sense. Pre-coma, I had more fatal diseases than you could shake a stick at. Fluffy and I stopped counting at ten. One doctor with a huge ego wanted to clump them all together and name them after herself. That was the day I changed doctors. What a jerk! Anyway, all these doctors kept giving me tons and tons of medicines — more than any human being could ever take. Those big file cabinet drawers in my office and any other flat space in my office were full of drugs. I didn’t remember who gave me half of them, or why I was supposed to take them. I’ve got piles like this all over my office. Thank goodness I don’t need them anymore. Fortunately, the priesthood blessing I got when I was in my coma got rid of all those assorted fatal diseases. Now I guess I don’t need any of those drugs. I still have them, though. I’d like to have the money we paid for them, back in the days I needed them. There are two things I’ve learned from the Big Dig in my office. First, some things do not need to be purchased in excess. You only need one sewing kit. You only need one extra pair of contact lenses. You may only need five extra batteries for your reading light. You certainly don’t need 25 of them. The reason I bought so many sewing kits was that I kept losing the ones I had. The reason I kept going to the ophthalmologist was that I couldn’t find the contact lenses I had carefully hidden away for a rainy day. I’m sure I found in excess of fifty unused gel pens in my office. I kept buying them because I had no idea where the one I had purchased before were hiding. And this brings me to the second thing I learned from the Big Dig. Second, if you can’t put your hands on it when you need it, you don’t own it. I know this is true of some of our emergency preparedness equipment, and it drives me crazy. Several years ago, I became acquainted with Carolyn Nicolaysen. Carolyn, who has written several columns for the Nauvoo Times, is hands down the most adept person I have ever met as far as home preparedness is concerned. She has a website, Totally Ready, which helps people with different aspects of home preparedness. Over the years, she has inspired me to buy glow sticks and heat sticks and fire starters and Mylar blankets and all sorts of little gizmos that are great for home preparedness. In every instance, I have purchased these things and given them to Fluffy and forgotten about them. I have no idea where they are, and I suspect he has no idea where they are. And if they aren’t together and in a place where we can readily put our hands on them, I might as well have put them in the garbage the moment I got them in the mail. Section 88, Verse 119: Organize yourselves; prepare every needful thing; and establish a house, even a house of prayer, a house of fasting, a house of faith, a house of learning, a house of glory, a house of order, a house of God. I’m going to make the effort. I hope I can resolve to respect my corner of the home by keeping it organized just a little better than I did before.